I have never been to California, but now I have The Beach Boys in my head. Mary is right, you think of California and almost immediately the Beach Boys pop up. :) I've never been to but my. granddaughter moved there for a job and hopefully I'll be visiting. I hope you get a chance to visit your granddaughter here, Carol! I have no interest in visiting California! We visit Sandiego every year. I think we will be going again in June. My father's widow could use a pick me up. San Diego is one of my other favorite cities, Debby. I was lucky enough to live there for a couple years in college. It was fun to see it again last summer for RWA, though I was shocked at how dry it was. Maybe after all the rain we've had this winter, it'll be greener for your visit this year. jbiggar: I love your part of the world! San Francisco is definitely worth a visit. We're about a 90-minute drive away if we plan it right. :-) Stay warm! Well....as I tap my fingers on the keyboard I am watching a big flurry of fat snowflakes descend into view through my office window in Alberta. It's like being in a snow globe. California sounds might inviting about now....I had an interesting trip back in the the mid 70's hitchhiking from Mexico through California all the way up to Canada. There were hundreds of other hitchhikers at every stop. My favourite part was that we were picked up by a lovely woman travelling and site seeing. She got us off the highway to take us to see those beautiful redwoods you mention. Nice memory. Wow, Jan, what an adventure! I'll bet you have some amazing memories from that time. I really do love the snow. It's beautiful, and the silence after a snow fall is so cool. But I much prefer to visit and be able to leave it behind. ;-) I hope you can stay warm inside and enjoy the pretty scene! San Diego is on my bucket list. I want to visit their zoo. I at least got to see pictures when my daughter went a few years ago. catslady: The San Diego Zoo is awesome. The whole Balboa Park where it's located is pretty cool. There are several museums, and I love the botanical gardens. In fact, I used the botanical building as a meeting place in Blindsided, just for fun. ;-) I hope you get to see the zoo soon! Only been to San Francisco and it's definitely one of my favorite cities. Would love to visit LA and San Diego someday. Jane: San Francisco is great! I struggle to enjoy Los Angeles. It's better if you can stay by the water and visit the fun, touristy areas, but getting around is such a mess. I hate having to pass through it to get anywhere. Except San Diego is worth the drive. ;-) I hope you get to visit them all someday! We visited my sister a few years ago in Calif. And got to see my beloved Dodgers play a game in L.A. I miss Cali! I'm a Michigan girl who spent five years in the Riverside/San Bernardino area, and twenty years in Pasadena, where we were married and our three children were born. 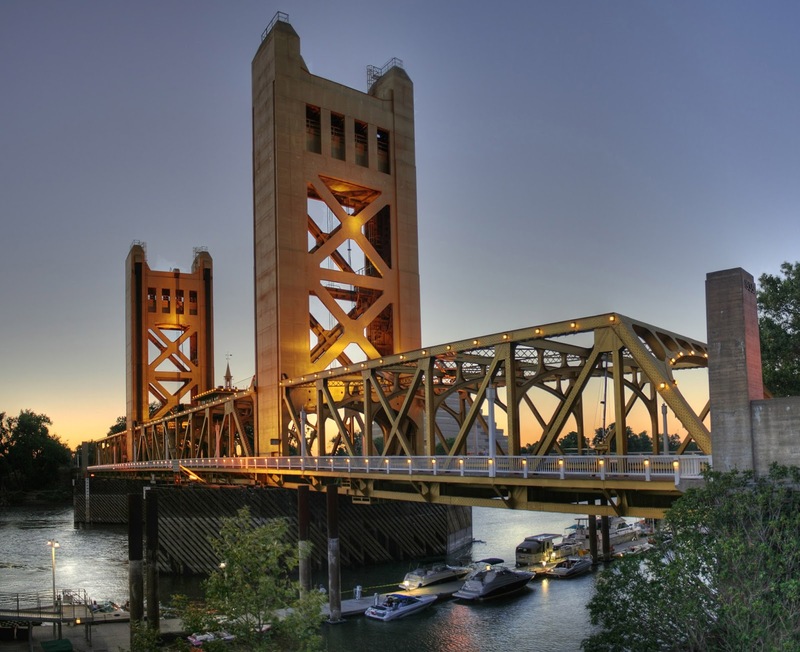 There's always something to do in Cali - formal or casual- just choose a destination. Pasadena was the best because you could be at the beach or in the valley or mountains in less than an hour! Currently in Tucson...Meh - love the history, hate the temps...but trying to convince the mister of how moving back to California would be beneficial (for me!). LOL! Pasadena is pretty! There really is always something to do in CA, from mountains to ocean to city. My parents were born and raised in Tucson, and I lived there off and on as a child. It's also where I met and married my husband after I left San Diego to attend the U of A. The desert is fascinating, but there's a reason we didn't choose to live there or in Phoenix (where hubby's from) when we finally had a choice again. Those dry, oven-like summers last way too long for me. I visited California twice many years ago - from San Diego up to LA then on up to San Francisco and over to Yosemite. I'd love to go back again & revisit the places I enjoyed and see the places I missed. Hi, Di! I hope you get a chance to come back. We visited Yosemite for Christmas about 12 years ago, and now it's on my list to re-visit when it's warmer and all of the trails are open. Such stunning scenery. 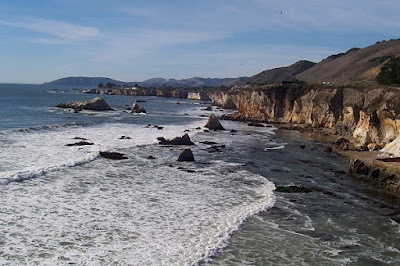 If you took Highway 101 on your trip, then you passed right through Pismo Beach (just south of San Luis Obispo) on your way up to San Francisco. 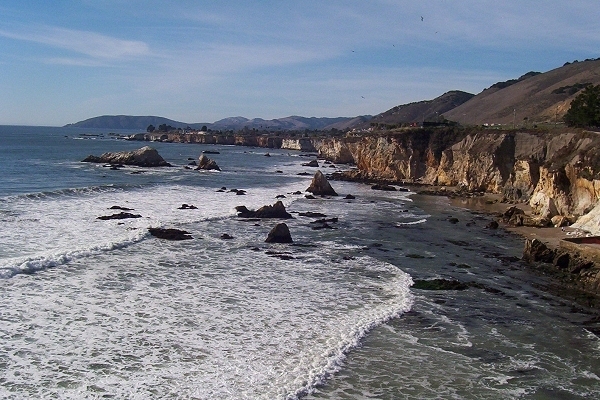 We were stationed at Vandenberg AFB, and lived in Santa Maria, about 30 minutes south of Pismo. I loved it there. Probably my 2nd favorite assignment. The drive up the coast is beautiful. Thanks for stopping by! My husband was stationed at McClellan Air Force Base for 2 years. We enjoyed it and spent the time seeing as much as we could. The World's Fair was in Vancouver , BC while we were in CA, so we traveled up the coast to attend it. Hit as many National Parks as we could and had a great trip. We enjoyed San Diego, which we visited while we were stationed in Colorado Springs before being in California. Had the best Nachos Supreme and Strawberry Margaritas at a cantina in Old Town. I think we went there three days in a row. Our favorite place to visit with the children while we were stationed there was the Monterey Bay Aquarium. The first time we went they had just finished filming Star Trek 5: The Voyage Home. They had items from the film, videos on the filming, and the "whale" they used in some shots. We would like to go back and visit - just us two adults. What great memories, librarypat! Thank you for sharing. I haven't been to the Monterey Bay Aquarium since we were stationed at Vandenberg more than a decade ago. What I remember most is that my son lost a tooth while we were eating lunch. ;-) I hope you make it back! My aunt lives there and hope to get to visit someday. It is beautiful there, my parents have visited. I hope you get a chance to visit too! Good luck getting there someday, Bube! I was born in California! Upland, CA to be specific - inland from LA in the foothills. We did many family drives all over the state in the 10 years I lived there. Sadly, I haven't been back since we moved years ago. That's a neat part of CA, Glenda. It's crazy to drive into LA on I-10 and see snow so close!